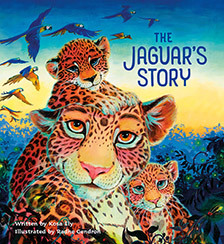 Journey to the Amazon to meet Inti and Chasca, two jaguar cubs who live in the rainforest with their mama. They spend their days making friends with birds and butterflies, swimming in rock pools, and learning to roar. Everything changes the day sky machines and land machines invade their forest. Afraid for their lives, the cubs escape with their mama under the cloak of night. Now everywhere they travel, surprises and dangers await them. Will they ever find a safe home?